We have three exciting shows to announce this fall. 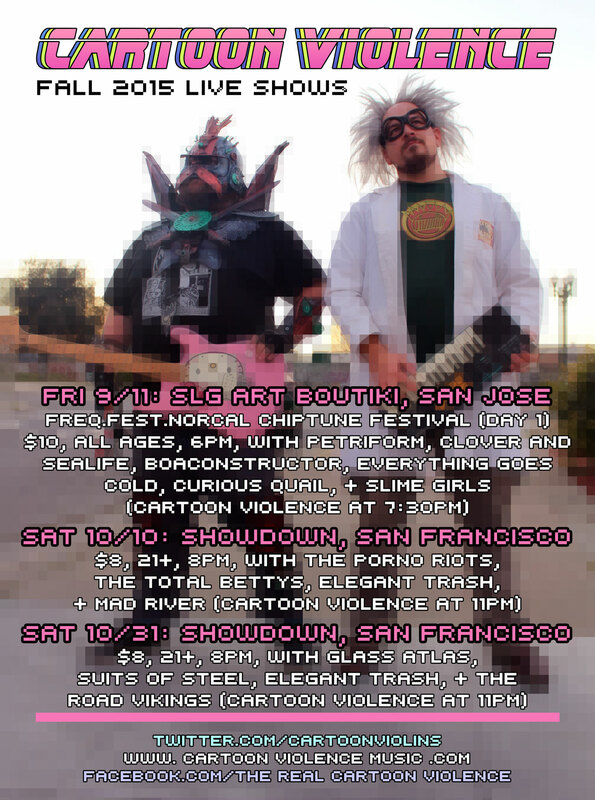 First, September 11-12 is Freq.Fest.Norcal, the first Northern California chiptune festival from the 8BitLA crew. Over two days, this event will feature 13 bands including Cartoon Violence, every one of which uses a GameBoy or other video game system as an instrument. Tickets are $10 per night and this is an all ages show starting at 6pm. Cartoon Violence plays at 7:30pm on Friday, 9/11. Second and Third, we are playing two shows at Showdown, a bar at 10 6th Street in San Francisco. Our first show is October 10th, and our second is Halloween, October 31st, both on a Saturday. Shows are $8, 21 and over, and start at 8pm. Cartoon Violence plays both nights at 11pm.